The US Food and Drug Administration (FDA) has approved an angiotensin II intravenous formulation (Giapreza, La Jolla Pharmaceutical Co) for the treatment of hypotension in adults with refractory distributive and septic shock not responsive to IV fluids and other vasopressors. Giapreza will become available on the US market in March of 2018. Approval of Giapreza was based on the findings of the Angiotensin II for the Treatment of High-Output Shock (ATHOS-3) study (NCT02338843) which compared Giapreza with placebo for blood pressure maintenance in patients with refractory shock. ATHOS-3 was a double-blind randomized clinical trial that randomized 321 patients 1:1 to receive either Giapreza (n=163) or placebo (n=158). The median study patient age was 64 years (range 22 to 89 years), with 61% of the subjects being male, 80% white, 10% black and 10% other races. 91% of the subjects had septic shock while the remainder had other forms of distributive shock such as neurogenic. At the time of Giapreza administration, 97% of subjects were receiving norepinephrine, 67% vasopressin, 15% phenylephrine, 13% epinephrine, and 2% dopamine. 83% of subjects had received 2 or more vasopressors and 47% 3 or more vasopressors prior to study drug administration. Patents were not necessarily on maximum doses of other vasopressors at the time of randomization. Patients requiring high doses of steroids, those with a history of asthma or bronchospasm, and those with Raynaud’s syndrome were not included. Doses of Giapreza or placebo were titrated to a target mean arterial pressure (MAP) of ≥75 mm Hg during the first 3 hours of treatment, while doses of other vasopressors were maintained. From 3 to 48 hours, Giapreza or placebo were titrated to maintain MAP between 65 and 70 mm Hg while reducing doses of other vasopressors. The primary endpoint was the percentage of subjects who achieved either a MAP ≥75 mm Hg or a ≥10 mm Hg increase in MAP without an increase in baseline vasopressor therapy at 3 hours. The primary endpoint was achieved by 70% of patients randomized to Giapreza vs. 23% of those who received placebo (OR=7.95, 95% CI 4.76-13.3, p<0.001). The median time to reach the target MAP endpoint in the Giapreza group was 5 minutes, and the effect on MAP was sustained for at least the first 3 hours of treatment. The median dose of Giapreza was 10 ng/kg/min at 30 minutes with only 2 (1.8%) of the 114 responders receiving more than 80 ng/kg/min at hour 3. At 48 hours, the mean improvement in the cardiovascular Sequential Organ Failure Assessment (SOFA) score was greater in the Giapreza group than the placebo group (-1.75 vs. 01.28, p=0.01). Serious adverse events were reported in 61% of Giapreza patients vs. 67% of placebo patents, with the most significant adverse event being an increased rate of venous thromboembolism compared to placebo (12.9% vs. 5.1%), with 7 incidents of deep vein thrombosis (4.3% vs. 0%). Mortality at 28 days was 46% in the Giapreza group and 54% in the placebo group (HR=0.78, 95% CI 0.57-1.07, p=0.12). Giapreza is a synthetic formulation of human angiotensin II which is a naturally occurring peptide hormone of the renin-angiotensin-aldosterone system (RAAS) that causes vasoconstriction and an increase in blood pressure. Angiotensin II exerts its effects through several mechanisms including an increase in sympathetic activity, an increase of tubular reabsorption of Na+ and Cl- in the kidneys, an increase in aldosterone secretion by the adrenal cortex, arteriolar vasoconstriction, and stimulation of ADH secretion leading to increase water absorption in the renal collecting ducts. 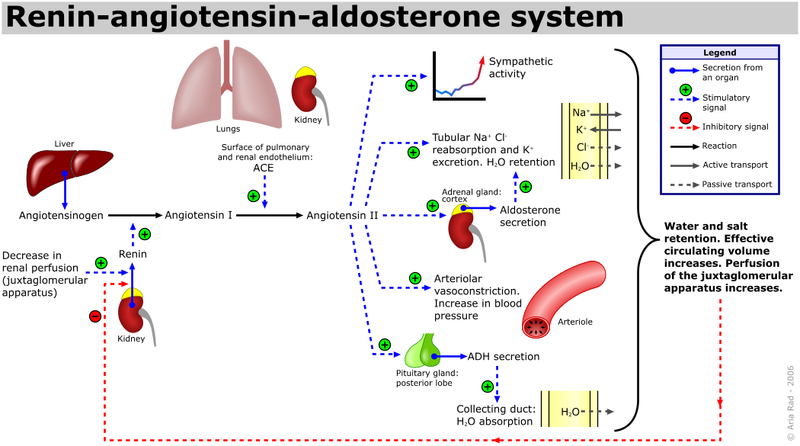 The RAAS system and effects of angiotensin II are summarized in the figure below. The recommended starting dose of Giapreza is 20 ng/kg/min via continuous IV infusion. Administration through a central line is recommended. Monitor blood pressure response and titrate GIAPREZA every 5 minutes by increments of up to 15 ng/kg/min as needed to achieve or maintain target blood pressure. Do not exceed 80 ng/kg/min during the first 3 hours of treatment. Maintenance doses should not exceed 40 ng/kg/min. Doses as low as 1.25 ng/kg/min may be used. Once the underlying shock has sufficiently improved, down-titrate every 5 to 15 minutes by increments of up to 15 ng/kg/min based on blood pressure. For full prescribing information, please refer to Giapreza’s PI document available here. Giapreza is the first drug approved by the FDA specifically for septic shock since the agency’s approval of drotrecogin alpha (Xigris, Eli Lilly) in 2001, which was later withdrawn by the company in 2011 for failure to show efficacy in a phase IV post-marketing trial. Unlike Xigris, however, Giapreza was approved on the basis of effective improvement in blood pressure and not a reduction in mortality. In this sense, Giapreza is more similar to Terlipressin, a vasopressin analogue, which is not approved for septic shock in the US, but which is available in Europe and other markets. ATHOS-3 did not show a mortality improvement in these patients possibly because they were quite advanced as indicated by the fact that patients were already on 2 or 3 vasopressors at the time of Giapreza administration. A positive clinical signal was however obtained, as indicated by a reduction in SOFA score, and perhaps earlier administration of Giapreza may have moved the mortality numbers in its favor. This would be a valuable study to conduct in the future. It should be noted that given the higher incidence of thromboembolic events with Giapreza compared to placebo, appropriate venous thromboembolism prophylactic treatment must be employed when administering this drug. Given that Giapreza is an angiotensin II formulation, its effects can also be significantly affected by concomitant use of angiotensin converting enzyme inhibitors (ACEIs) and angiotensin II receptor blockers (ARBs), drugs that are in very common use. Concomitant use of ACEIs may increase Giapreza activity and ARBs may decrease Giapreza activity. Dose adjustment is not necessary in either renal or hepatic impairment since angiotensin II is not cleared by either of these routes, but is rather quickly metabolized in the blood with a half-life of less than 1 minute. For more information on Giapreza or ATHOS-3, please refer to the Giapreza package insert, the ATHOS-3 NEJM study and this presentation by La Jolla Pharmaceuticals.